It has never been easier to join the jamboree all the exclusive benefits of the D23 membership are now available as a gift card. You can give a friend or family member the gift of an exclusive D23 membership with the purchase of the Disney D23 gift card. The D23 gift card gives the card holder a one year membership in Disney’s D23 club, a one year subscription to the Disney twenty-three magazine, discounted tickets to the D23 Expo (worth $84) held annually and access to members only merchandise and special events. Perhaps one of the biggest perks of D23 membership is the iconic D23 membership certificate and a surprise gift from the Disney Archives. The D23 Disney gift card is available for only $74.99 from all domestic Disney Stores and all Disney Land Resorts. The tickets to the D23 expo alone are worth the price of the Disney gift card. This is an incredible gift for any Disney fan, act now because these wont last long! 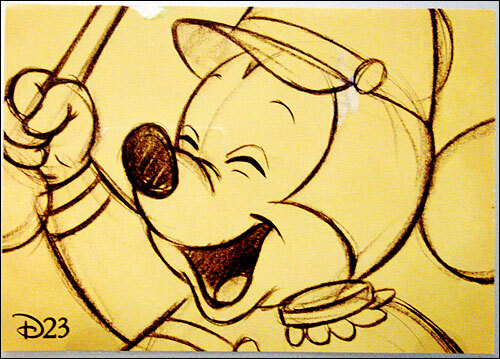 Be sure to keep your eyes peeled for Disney Gift cards appearing on Giftah. Occasionally someone receives a Disney gift card that is not a big Disney fan, these cards end up on Giftah’s gift card marketplace, usually selling for a large discount. Keep your eyes open for the incredible deals on these discounted Disney gift cards they won’t last long. 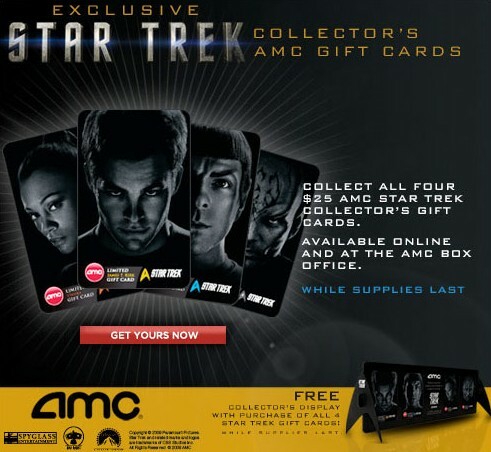 For a limited time AMC Theatres gift cards can be purchased with a special edition Star Trek image. The exclusive Star Trek collectors AMC gift cards come in denominations of $25 each. The cards are available online and at AMC box offices while supplies last. There are four different AMC Star Trek gift cards available featuring the image of four characters from the movie: James T. Kirk, Spock, Uhura and Nero. If you order all four designs you will also receive a free card display stand while supplies last. Surprisingly gift cards have often become collector items. Harry Potter gift cards with no balance remaining have been sold to collectors on e-bay and other fan sites. Its hard to imagine collectors going after mass produced pieces of plastic, but certain cards are produced in limited quantity making them slightly more valuable to collectors. There is no word on how many AMC Theatres Star Trek gift cards have been produced, but the success of the movie should make the AMC gift cards more desirable to collectors.